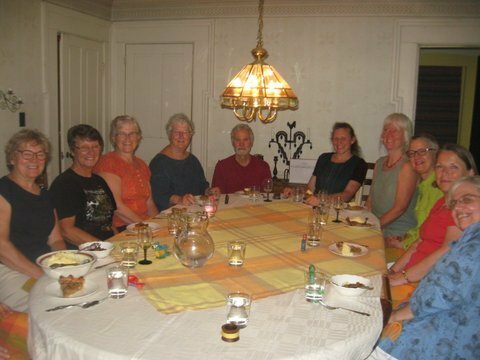 We welcomed two guest teachers to Vävstuga this month: Barbara Burns and Wendy Jensen. Both of these accomplished artists and teachers were very well received by their students and we look forward to welcoming them back in the future. 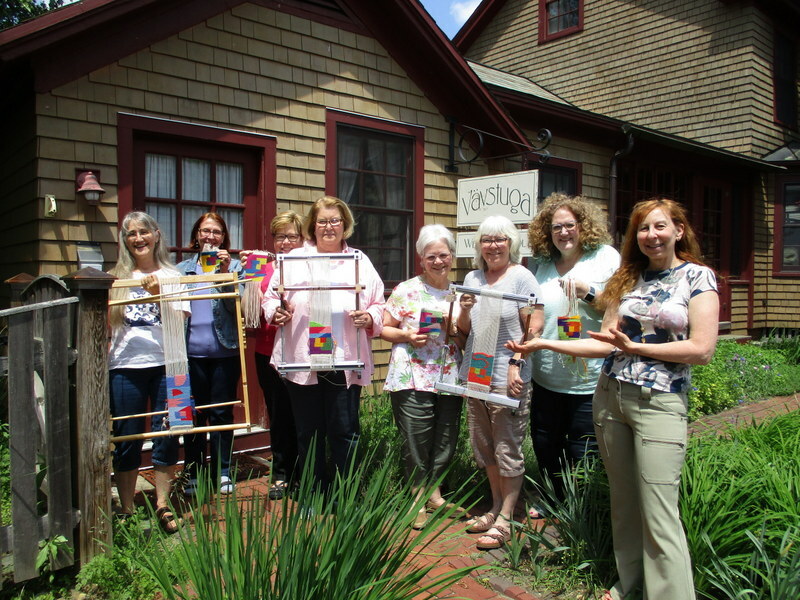 Barbara Burns (at far right) taught our Tapestry: Beginner and Beyond class, June 6-8th. Students were guided through the process of warping a loom and were taught a variety of skills, creating a tapestry sampler to serve as a reference for future explorations. 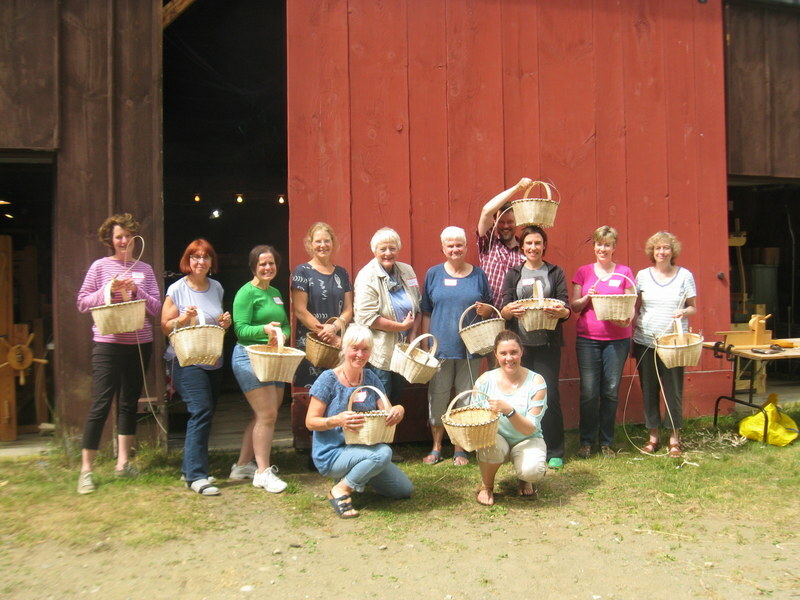 Wendy Jensen (4th from left) returned to Vävstuga for her second time teaching her Basket Weaving class out at the Barn Studio. This time Wendy offered her “Williamsburg carrying basket”, teaching students how to weave a basket base around a sturdy, preformed, hickory handle, with an emphasis on shaping, rim fitting, scarfing and lashing. 3 Week Mini Immersion begins! Also starting this June was our inaugural Mini Immersion program which runs from June 18th- July 6th. We welcomed 10 students from around the country and the world, including Washington, New Mexico, Colorado, Indiana. Iowa, Ohio, Florida, West Virginia, Canada and Australia! We feel so fortunate to get to spend 3 weeks with this wonderful group of people as they focus on this in depth program. They will learn 10 techniques from our most popular classes and go home with a deeper understanding of the advantages of weaving the Vävstuga way and the skills to pursue their own weaving with this great foundational and challenging experience. 8 of the 10 made it in time for the first supper with Becky and Leni! More pictures to follow in next month’s News. We had the good luck of obtaining the remaining copies of this wonderful, out-of-print, book Vävglädje (Happy Weaving) from Lillemor Johansson, who started and operated the Vävmagasinet from 1982 until 2003. Vävstuga Press re-printed the English supplement to accompany the text. The book and English supplement are sold as a set on our web store. You can watch Becky’s video review of the book on our Vävstuga Youtube channel, along with many other helpful book reviews and instructional videos. Join us at Vävstuga for a great class, visit our store (Tues–Fri 9–3) or our web store any time, and check out our Facebook page and Ravelry group.